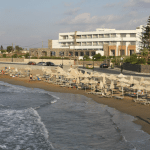 The resort of Gouves in Crete is the perfect choice for family holidays. With some lovely beaches and great places to eat. Gouves is central to the airport and the capital city with its modern shops nestled in with ancient markets. 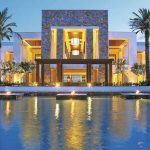 The resort of Gouves in Crete is the perfect choice for a couples or family holiday. 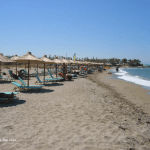 The resort of Gouves or Kato Gouves to give the village its full name is just 25 minutes drive from the local airport of Heraklion and sits proudly on the beachfront. Gouves has that small village atmosphere and has some excellent traditional and modern hotels and apartments. As you walk down from the the traditional older part of the village past white washed houses you come onto the main street which leads you right down to the beach. Gouves has some excellent nightlife with small bars and cafes, as well as some of the best restaurants on the eastern side of the island. 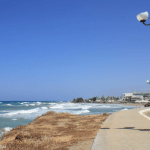 Gouves has 3 small sandy beaches ideal for catching the rays and enjoying some quality time with the family. Make sure you are aware of the flag system in use on Greek beaches, usually the red flag will fly when its very windy due to strong currents. Watersports are available straight off the beach, you can try your hand at windsurfing, pedaloes or banana boat rides for five to 10 euros. If you intend to use the sun loungers or umbrellas on the beach then be prepared to spend a couple of euros per day as these aren’t free. There are a handful of cafes on the front where you can grab refreshments and even a snack from and the prices aren’t too expensive. Around the village centre you will also find many supermarkets and small gift shops for buying local goods and produce as well as gifts for friends and family back home. If you want to tour the local area and hillside villages then you must take the Happy Train ride which meanders around a few of the local villages and normally goes up into the mountains for some amazing views. 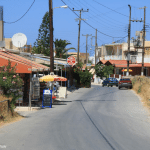 If you want more options for shopping then Heraklion is only a short bus ride away for a couple of euros and has all the shops you will need. 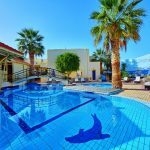 If you want to take the kids out for the day then Watercity is just 15 minutes drive away from Gouves and is a great family day out, alternately you can visit Crete Aquarium which has been built quite recently and houses all the native fish from the seas around Crete and is a great day out. Gouves has some fantastic nightlife on offer with small bars and the occasional disco offering entertainment into the late evening. The bar owners are friendly and very welcoming and you will end up spending most of the night chatting to the owners or staff and having a fantastic night out in Gouves. One of the most popular bars has to be Booze Bar with skilled barman doing all sorts of trick and amazing cocktails keeping you entertained all night. You will also find the larger hotels and apartment complexes offer entertainment from Greek nights, BBQ’s, quiz nights and karaoke nights. If you have kids they will love Gouves for the fun nights in and out of the hotel. There are some excellent all inclusive and full board hotels in Gouves but if you choose to go self catering then the restaurants in Gouves will have you coming back night after night. 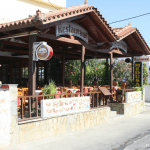 Try Taverna Filoxenia for some excellent local cuisine including freshly caught fish and home cooked food. Over the internet their have been some excellent reviews of Asteria restaurant which does some of the best food in Gouves and offer a warm family welcome. If you go on the right days you will find they do authentic Cretan entertainment and these nights are usually very popular. Moving into Kato Gouves you will find a great Indian restaurant called The Chili Lounge.